Monday October 8, Spartathlon plus nine: I woke up this morning to headlines from a meeting of the Intergovernmental Panel on Climate Change currently being held in South Korea: ‘Final call to save the world from climate catastrophe’ read the pages of BBC News online. For those who don’t know, Spartathlon is a 153-mile (246km) road race in Greece that traces the footsteps of Pheidippides, the ancient Athenian messenger who ran from Athens to Sparta to ask for Spartan help in the 490BC Battle of Marathon against the invading armies of thePersian Empire. It’s widely billed as one of the toughest foot races on earth. Starting at dawn under the Acropolis participants have to battle the heat of late-Greek summer (yeah, right), punishing cut-off times at 75 checkpoints along the way, a maximum time limit of 36 hours, the idiosyncrasies of some Greek drivers, and a 1,000m ascent of a mountain path sometime in the middle of the night. It’s such a harsh and unique set of conditions that often only 50 percent of starters get to the kiss the foot of King Leonidas, the notional end of the race in Sparta itself. For me, this was my fourth attempt (I was successful in 2015, 2016 and 2017). I’m attracted to the race because of its history, unique atmosphere and location – there’s something about Sparta that gets right under the skin. See the number of people who come back year after year. Glutons for ultra punishment, indeed. Having been brought up in Greece and with family and many friends still there, it’s also become to feel like my hometown race, plus I’m heavily involved in supporting the team of British runners we send each year, helping a small organising committee raise funds for team uniforms, passing on race information to people and promoting the team and the race in the media. A fourth consecutive race brought on new pressures for me, expectancy being the key one: “You've done it three times, surely a fourth is a given”. Plus my wife, Laura, and I had decided to take our twin daughters, Martha & Gracie, with us for the first time. I could not let them down by not finishing. As well as the extra pressure, my build-up to the race wasn’t as good as I would have liked. Various health problems, scares and minor gripes saw me averaging just 70 miles a week in training as opposed to the 100 I would normally do. But I took some solace from a final strong month in August and in the fact I had managed to come up with a decent, tried and tested nutrition plan. In the past, I’ve always had tummy troubles at Spartathlon, largely brought on by my not adapting well to gels over that kind of distance, but also because I often find it hard to eat solid fuel when I run. This year, I opted for a mix of our very own Peak Pinole Ultra Bites being tested over such a distance for the very first time, 33 Shake chia gels and fresh fruit. I’d also done a batch of egg and cheese muffins and some mini apple pies in an effort to keep the food as natural and fresh as possible and was being hydrated by a mixture of water and Tailwind. Having never really troubled the timers before the 35-hour mark in my past attempts, I’d also secretly set myself a target of a 33-hour finish. I reckoned I could make a lot of this up by spending less time ‘getting pampered’ at the designated crew points, where I’d be meeting my team, Laura and her friend Nicky, and managing to go a little faster on the final downhill into Sparta itself. The last days in the lead up to the race are always a bit of blur as we rush around to register and help deal with other runner queries from the British team. This year that was compounded by a supplier letting us down with the team kit that meant we had to scramble around for last-minute replacements. It’s hardly the prep you need before your season A-race. Nonetheless, the morning of September 28 came around and I headed to the start at the Acropolis with some optimism. Maybe not 33-hour optimism but confident enough that I could beat my best previous time of 34.55. And then the rains came. As I said earlier, Spartathlon is held in September. Sure the weather in Greece is about to change at that time of year and you might get the odd drizzle, but usually temperatures are at least in the high 20s, with clear skies and little cloud cover. I’d read some reports about potential storms – but at that time of year in Greece, they normally come in, throw it down for a few hours and then burn out. As a result, I packed far lighter than perhaps I should have: one taped seamed jacket, a couple of jackets for warmth, and two or three different tees, plus an extra pair of shorts and trainers as a ‘just in case’. I tend not to feel the cold when running, but I threw in one base layer too. Under the stars at the start, you could see everyone was trying to second-guess the weather and what to wear. There’s no chance of seeing your crew for around four hours until the marathon point, so whatever your choice, it was going to stick with you for a good 10 percent of the race. I opted to take a jacket and tie it around my waist just as the gun went, furiously trying to tuck bits in here and there as I tried to stop myself slipping and sliding on the marble and cobbles that lead down from the Acropolis. I started with my good running buddy Darren Strachan of coaching duo DazNBone and we matched each other for the first four miles chatting away happily as the rain came down in a steady drizzle. Without wearing the jacket and not wanting to lose time untangling it at this point, within a couple of miles I was already drenched, though not in an uncomfortable way yet. Daz stopped for a pee and I slowed down so he could catch back up, to no avail. At checkpoint five, around 10 miles in, I waited for five minutes but was starting to get cold and so started running again. I was not to see him for another 120 miles! The first marathon flew past with me coming in just over four hours to Megara, I quickly changed my top, grabbed some food from the excellent Laura and Nicky, and carried on. All was feeling good and the nutrition strategy was holding nicely, but I was starting to feel a slight niggle in my left shin. I decided to take a gamble and run the following marathon distance taking out the orthotic inserts I normally wear in my shoes. These are generally really good for me, but if one gets in slightly the wrong position, it can start to affect my gait, so I thought I’d see what things were like without them. The next major checkpoint, Corinth at 50 miles, is probably the most significant of all. The race times force you to go fast until here and I did just that, arriving 1h .25mins ahead of the cut offs and feeling a million dollars. The orthotics issue seemed to be neither here nor there, so I put them back in, correctly this time, and carried on. Miles came and went with no major issues. Nutritionally the PP bites and gels were working, with the odd bit of real food thrown in, and I was steadily gaining time on the check points. By early evening, the steady trickle of rain was now a constant downpour. At Nemea, the half-way point, I was some 25 minutes up on the previous year and around 10 minutes ahead of my goal times. It felt like I was flying. From Nemea, the steady rise and fall of the land begins as the course undulates before the legendary climb over Mount Parthenion comes at the 100mile point. Over the next miles, the niggle on my left shin steadily became worse and the skies were now pouring with rain that necessitated more kit changes. As the niggle grew, I started to take more walking breaks, losing a bit of the time gained but not enough to make me worry. I figured a stomp over the mountain would see me good for the last two marathons on day two, at least half of which is the final downhill into Sparta itself. And so stomp it I did, probably a bit quicker than I needed to. By the time I arrived at Mountain Base, the in just under 20 hours, my legs felt like jelly and the pain in my left shin was spreading but with 16 hours to do 53 miles, I was pretty confident of a finish. It was then that GB captain Paul Ali came into the CP being carried by two race officials. Seeing him in some distress knocked my confidence a bit. I decided to take the mountain pass slower than in previous years given the rains had now added gale force winds and bitter cold into the mix. Coming down the other side was even more treacherous as cloud had descended and I couldn’t see the start or end of the paths. Two falls almost led to a submission… both further jarred whatever the injury was and I was now in pain as I hobbled down. Survival and getting to the end became my main goal. The bottom of the mountain coincides with a long stretch of planes. You really should be running but it’s cold and your circadian rhythms really want you to sleep. I ran/walk/slept all at the same time, being shocked back awake as my foot would stumble off the road. Checkpoints came and went. At one, I don’t quite remember where, Darren caught up briefly as I was about to leave. The rain was coming down in droves, my leg hurt (and had a red rash spreading all over it) and my nutrition began to suffer as I stopped thinking about food and only had a finish in mind. In the end I drank too much Coke at the aid stations and got to the point where I had to do a forced re-set with fingers down the throat to get me going again. At times like this, I attempt the stomp. I’m a pretty fast walker and even at this stage in a race can knock out successions of four-hour miles – and so that’s what I did. Protect the leg, let the tummy settle, keep the time head of the cut offs – which from a high of three hours had now dwindled back to 90mins – and then just let gravity take over for the final 20 miles downhill to Sparta whereby I should be able to re-gain some lost time. 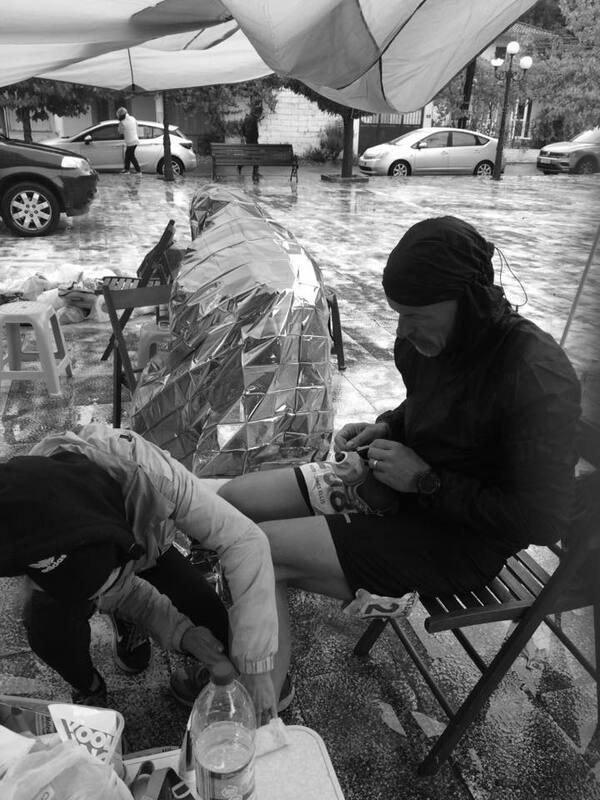 At CP60 I managed to get some quick treatment on my by-now strapped shin, courtesy of super race physio Mimis Sas but as I set off from the CP, the Medicane, or Storm Zorba, as it became to be known, was hitting with a vengeance: swirling winds, trees bent over double, slates falling from roofs. It was absolute chaos. I climbed the last hill out of Tegea – it always seems endless – and then started the descent into Sparta… although running was no longer an option as I dodged loose branches and bits of debris and was running straight into the rain which just stang like a million tiny needles. I yelped in pain and Laura and Nicky were so concerned they came and drove in the opposite lane alongside me, just to make sure I made it to the last crew checkpoint, six miles out at Voutiani where chaos was ensuing as cars were being swept away and shunted in people’s panic to look after their runners and themselves. Sparta itself, I thought would come as as blessed relief as I crossed the Taygetos river. Surely being surrounded by buildings would cut back on the rain and wind? I tore off the bin liner I was now wearing to try and keep me dry and started to run again. Within a few metres the wind and rain started once again to howl like crazy, soaking me to the bone. Eventually I made the final turn to see the statue of King Leonidas. No massive crowds were waiting this year as people sensibly took shelter from the storm. The flag poles at the end of the race were rattling in the wind. The guys on the PA system had long since gone and, aside from a handful of lovely people in the last café, there was hardly anyone around. Martha and Gracie and their two cousins Nikitas and Alexis came to join me, jogging up to the last few yards to the steps, to kiss the foot and to wear the crown of olives for a fourth time… Time: 35:07…. Long suffering wife Laura and our pal Nicky – I think I only shouted at them once this year when they almost managed to suffocate me while trying to cover me with a bin bag – but they were, as ever, excellent in guiding me and putting up with me for 36 hours. You’re the best. All my fellow BST members and their crew, especially my good pals Darren Strachan and David Bone, Jeff and Jane Strachan for their support by osmosis, Paul Ali and Rob Pinnington for organising the team, and Chris Mills for the pics. All the members of International Spartathlon Association and the wonderful volunteers that make this such an amazing race. Alex and the rest of the team at Peak Pinole – I think we have a product that works! Check out the official film of the 2018 race above… Epic stuff.